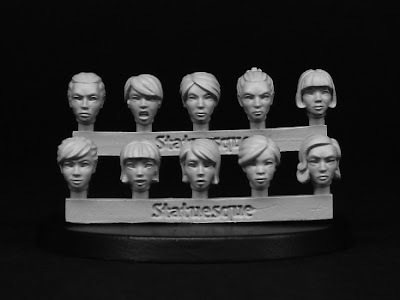 Khorosho Productions: Heroic Scale Female Heads 2 available to Pre-Order now! All the Statuesque Heroic Scale sets! Statuesque Miniatures is pleased to announce the Pre-Order of a new set of Heroic Scale conversion parts – Heroic Scale Female Heads 2. 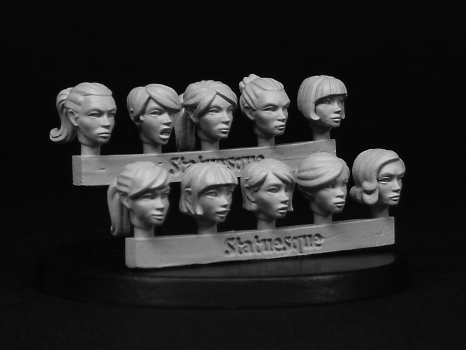 Featuring 10 new, metal heads, Heroic Scale Female Heads 2 expands the range of Heroic-Scale heads even further, adding yet more variety to your conversions. Heroic Scale Female Heads 2 is reduced to only £4.50 for the Pre-Order, in addition to the usual quantity discounts. For some examples of how you can use your Heroic Scale heads, check out the Statuesque Miniatures Facebook page. Delivery of stock to Statuesque is expected late-March/ early-April. The Pre-Order Special Offer will run until then, or while stocks last. The first Heroic Scale Female Heads set is currently out of stock awaiting remoulding with delivery of castings due at the same time as the Heroic Scale Female Heads 2. As such I have opened a Restock Pre-Order on this item so you can order it along with the new heads. Please note, in order to further separate the Fine Scale, Pulp Scale and Heroic Scale ranges I have changed the SKU for the Heroic Scale items. From now on the Heroic Scale items have the codes SMA301 to SMA305. The products you receive may still be labelled with the previous codes, but are identical to products labelled with the new codes.